Alteration of the well-known logo of both the American Iron and Steel Institute and the Pittsburgh Steelers stopped me in my tracks. The Steelmark, as it’s formally known, has temporarily had its upper, yellow or gold astroid replaced by the Star of David. The altered logo is strangely powerful. My thanks to the creative person who thought of this. It arrives in the aftermath of an episode all Jews everywhere are still “processing,” to use vernacular for the inability to assimilate shock, rage, horror, sorrow, and disbelief all at once. The mark has been around since 1960. My family had moved to Pittsburgh in 1958, when I was three years old. In those days, the steel industry belched fire and smoke into the air from fearsome-looking factories along the Monongahela River. I never tired of the sight, especially at night. The interior of Temple Rodef Shalom is the other visual memory I have from my very young years. In fact, I also have a letter to my parents from the then-young rabbi, Walter Jacob. He states, “It was a pleasure to have Tommy read a prayer to the assembly yesterday at our services. The prayer was quite mature and very well written.” Alas, I no longer have the brilliant work I read and delivered back in March, 1965, at age 10. But the Rodef Shalom web site lists Rabbi Jacob as still alive and in the role of Rabbi Emeritus. Judaism was important to our family. My dad avocationally taught Sunday school at Rodef Shalom. We were there a lot. During our first year in Pittsburgh, while awaiting construction of our house in the suburb of Churchill Borough, we lived in Squirrel Hill. We rented a floor in a duplex house at the corner of Bartlett and Murdoch Streets, only a few minutes’ drive up to Fifth Avenue. We probably drove right by the Tree of Life synagogue. The upstairs tenants were strict Orthodox Jews. Sometimes one of us would turn off a light for them on Shabbat, or tear a roll of toilet paper into pieces. I can no longer picture them, but do remember the two families, living close together for just a moment in time, got along. They had a son my age I’d play with on the sidewalk. As I wrote decades later as a synagogue president, the interior of the Rodef Shalom sanctuary, to a young child, certainly appeared to be the sort of place in which God would dwell. The vaulted ceiling beneath the romanesque squared dome, the stained glass, the peal of the pipe organ…well, you just looked up in wonder. The last time I saw the place was in 2000, while running the Pittsburgh Marathon. The route included a stretch of Fifth Avenue, so I slowed down for a moment to get a good look at the exterior. To know that very space hosted funeral services for those murdered down the street is a sort of comfort. In the rawness following the tragedy of Tree of Life, I’m not buying a Steelmark logo T-shirt, but I am considering myself — however distantly — part of the Squirrel Hill diaspora. It was in Squirrel Hill that the seed of my lifelong devotion to Judaism was planted. In reality, every Jew everywhere should consider him- or herself part of the Squirrel Hill diaspora. Other memorable places of my childhood, like Snyder’s Smoke Shop in Woodbury, New Jersey with its vast array of penny candy, have disappeared. 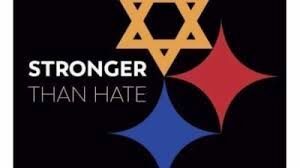 Synagogues and congregations also wink out from time to time, but the Pittsburgh Jewish community and its institutions have proven durable. Earlier this week my synagogue of the past 27 years (Beth Ami of Rockville, Maryland) held a service in honor of the Pittsburgh martyrs. It was part religious observance, part rally. Many local Christian, Muslim and Sikh people attended and joined in. Thus good-hearted people of all faiths, at least this week, are diaspora. To Montgomery, Alabama; Oak Creek, Wisconsin; Charleston, South Carolina; and Sutherland Springs, Texas we may now add Squirrel Hill. ← A weekend of sweet music: Noisy engines!